Golf is a transformative sport that inherently teaches valuable life lessons like honesty and perseverance…not to mention a good sense of humor! As one of the few sports that can be played for life, golf can also enrich lives and open doors for girls who want to play for fun, compete at the highest level, or to help advance their future careers. With this in mind, we’ve made it our mission to provide girls with the best chance to fall in love with the game by creating girl-friendly environments to help them learn and thrive! Fun is our hook, and, once we have the girls’ attention, we help teach them life skills all girls need like positive self-image, finding their voice, and learning to lead. We’re glad you asked! Research consistently shows that girls reap the biggest rewards when learning in all-girl environments, which helps them feel more comfortable and gives them a space where they are free to be themselves. Girls Golf sites make learning the game fun, social, and less-intimidating for girls who are just starting out, or want to play with other girls who share their interest in the game. Sometimes it’s NOT about Golf! LPGA*USGA Girls Golf sites offer instruction from certified LPGA and PGA golf professionals who are passionate about sharing the game they love with juniors…and they’re equally as passionate about having fun while they do! It’s our philosophy that everyone should learn the FUNdamentals of the game of golf. With this in mind, we pride ourselves in delivering golf instruction through engaging activities to foster learning and development. 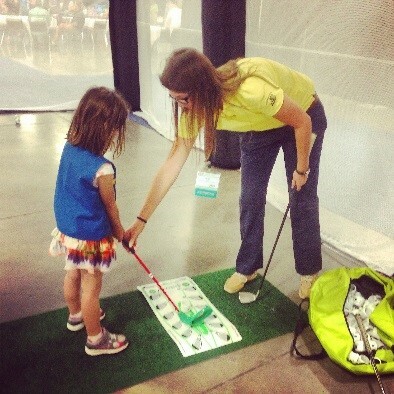 A typical Girls Golf event could include anything from hitting marshmallows out of a bunker, taking a field trip to a professional golf tournament, or hosting a pirate-themed golf competition. Yep, that’s right – pirates! Creativity is Queen when it comes to Girls Golf, and we’re not afraid to think outside of the box!